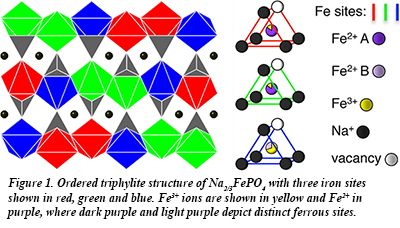 The sodium counterpart to LiFePO4 has recently attracted attention as a potentially promising cathode material. Sodium is one of the major rock-forming elements in the Earth’s crust and is both environmentally abundant and affordable. As a result, the development of sodium analogues to lithium cathode materials is appealing, especially for large energy-storage systems. In recent work at HPCAT, Sally Tracy, a graduate student in the group of CDAC Academic Partner Brent Fultz, has investigated the the interplay between sodium ordering and electron mobility in NaxFePO4 (Fig. 1) using a combination of synchrotron x-ray diffraction and synchrotron Mössbauer spectrometry (nuclear forward scattering). The results provide the effect of temperature on the sodium redistribution on the lattice and give new information about the phase stability of the system. An analysis of the temperature evolution of the iron site occupancies from the Mössbauer measurements (Fig. 2) was used to identify the onset of fast electron hopping. 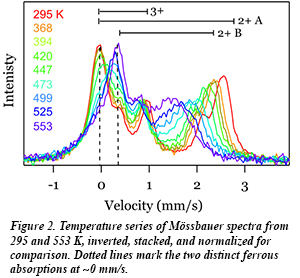 Combined with synchrotron x-ray diffraction, the Mössbauer measurements show a relationship between the onset of electron dynamics and the loss of local order on the sodium sublattice. Such coupled processes may be common to many materials used for battery electrodes, and new details concerning the influence of polaron-ion interactions on the charge dynamics are relevant to optimizing their electrochemical performance [S. J. Tracy et al., Chem. Mater. 28, 3051-3059 (2016)].